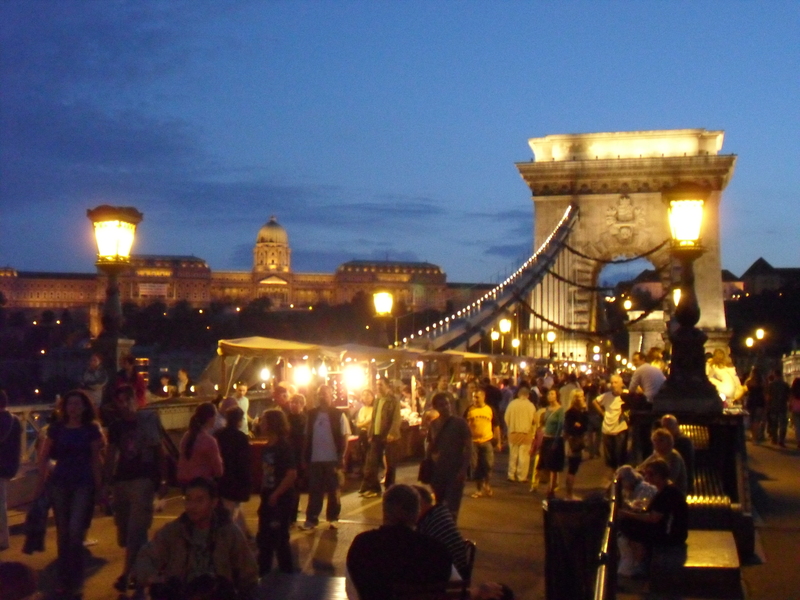 In July of 2009, my husband Bill and I went to Budapest, Hungary and Prague, Czech Republic. 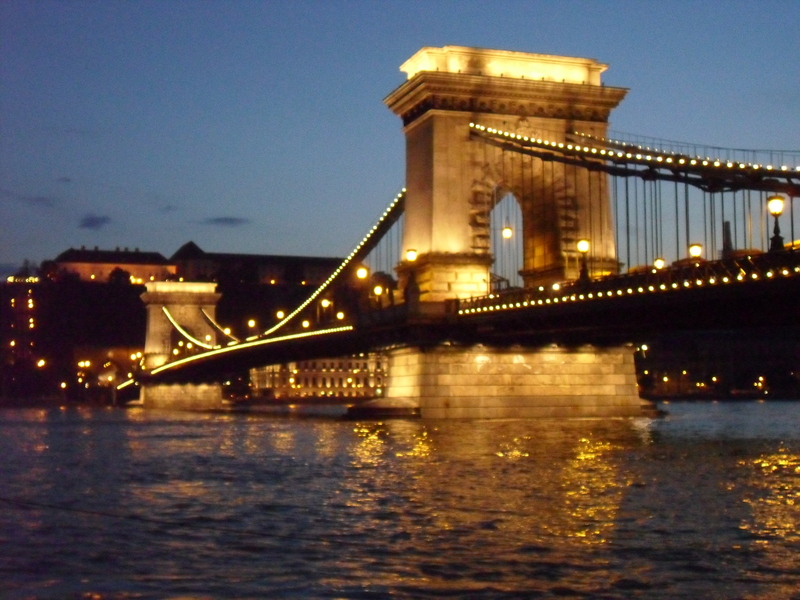 Our daughter had been in Hungary for 18 months on a mission for our church. Bill also worked on movies for NBC over there and wanted to show me some of the amazing sites in both cities. Honestly, I had no idea just how interesting and fun this trip would prove to be. I was under the impression that in order for a vacation to be complete, it needed to include palm trees and the ocean. Not true. Rivers, ornate architecture, beautiful cathedrals, charming streets and international food can be just as romantic and relaxing. 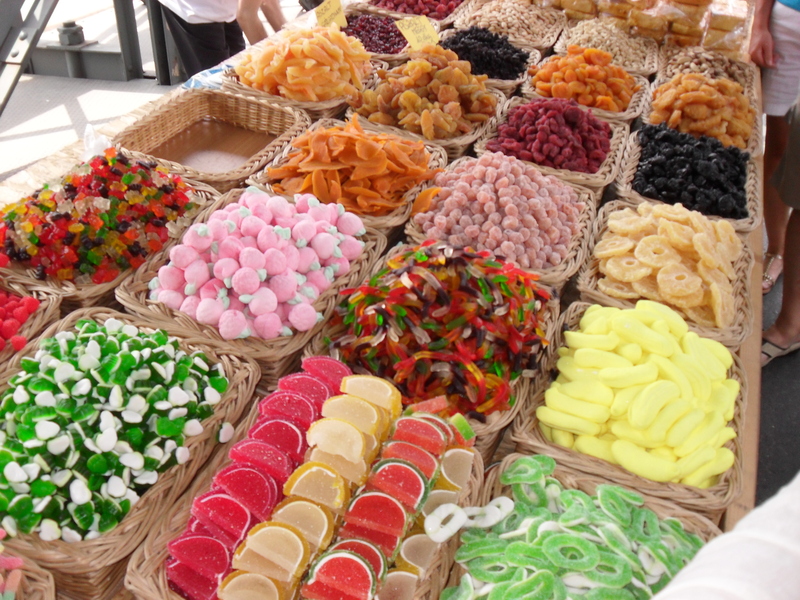 There were several vendors and food stands like the two above One had all kinds of dried fruits and gummy candies just sitting there to be purchased by the pound. I kind of wondered about flies, but never saw any. 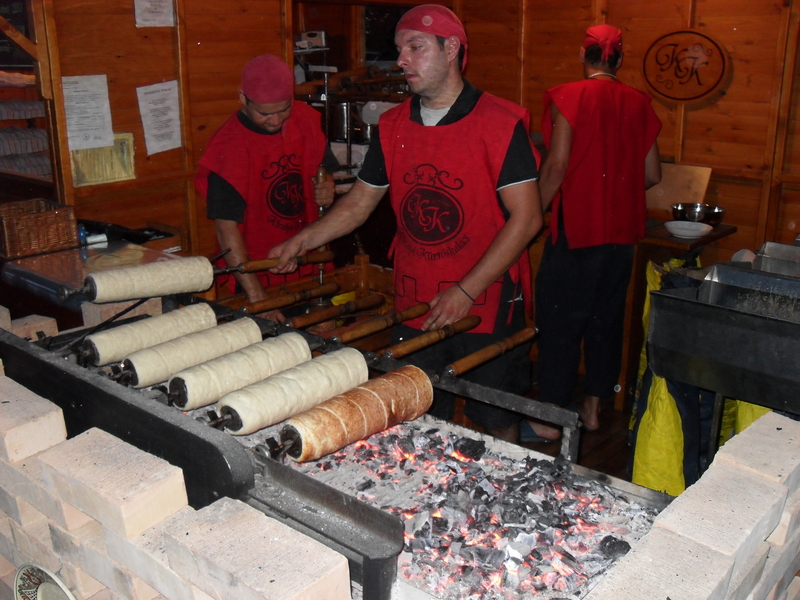 The next photo shows an interesting rolled cinnamon bread cooked over hot coals. Another stand that really sparked my interest was grilling beautiful chicken kebabs and serving an amazingly fresh Greek salad. Both were so delicious that I came home and created these recipes based on my memory of the flavors. 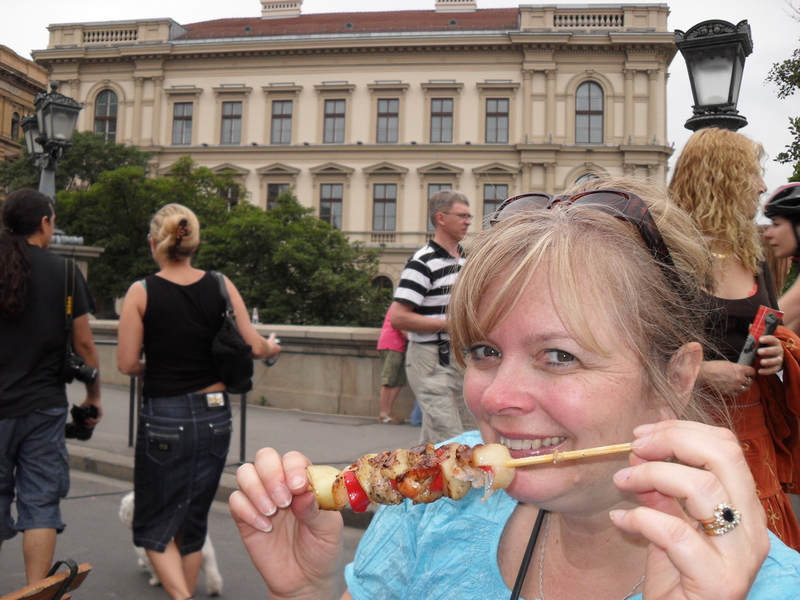 Me eating a chicken kebab fresh off the grill in Budapest, Hungary! The Greek salad is perfect for those hot summer days when you don’t want to cook a big meal but want to feel satisfied. 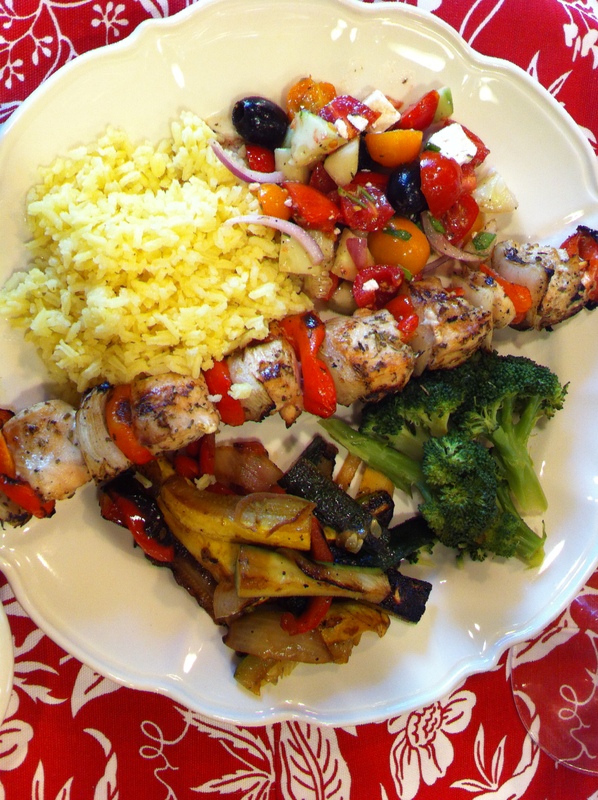 Or, grill some chicken kebabs, make some lemon rice and you have a Greek Feast! I even whipped up a little Tzatziki and some fresh grilled vegetables. I must say that this meal was amazing! 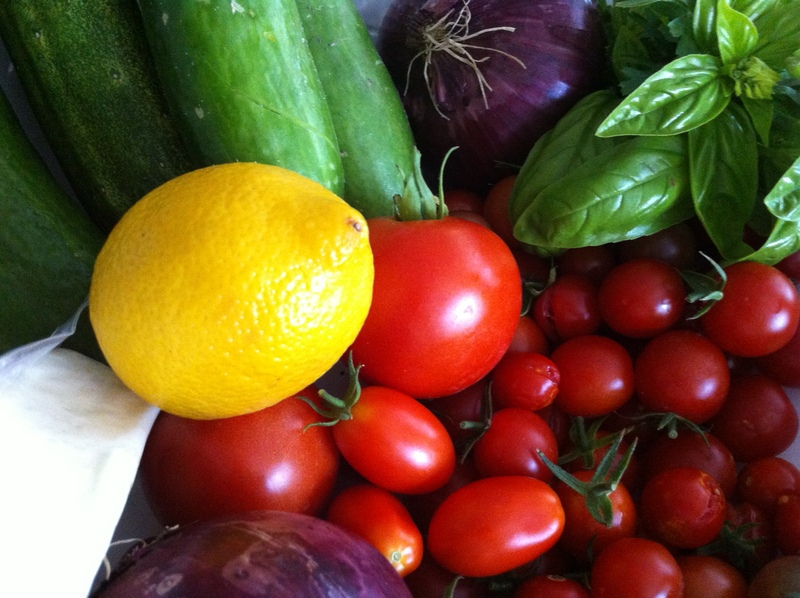 You will need plenty of lemons, fresh garlic and parsley so be prepared! Chop tomatoes into ½ inch pieces and place in a bowl. Cucumbers can be peeled or unpeeled based on your preference. If the seeds are gross, just scoop them out. Cut into ½ in pieces and add to tomatoes. Olives are just thrown in whole but you can cut them in half if you prefer. Cut the onion in half through the stem end and slice very thinly crosswise. Add to the tomato, cucumber, olive mixture. Squeeze 1-2 lemons over the bowl, sprinkle with olive oil to taste. Add herbs and salt and pepper to taste. Cut feta cheese into ½ inch squares and toss with the tomato/cucumber mixture. I add this last so the feta won’t get broken up. Chill and enjoy! Have fun with the herbs; if you want more flavor for instance, add fresh basil! 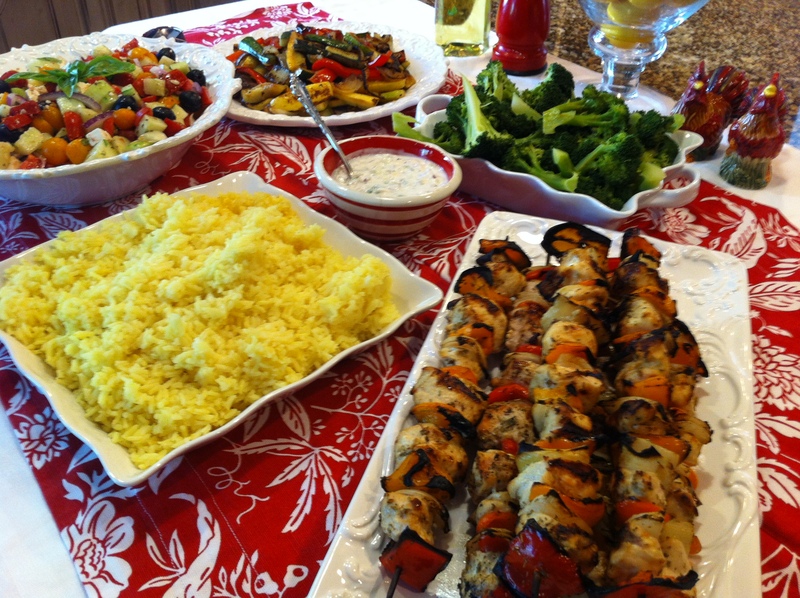 Wonderful served with Greek Chicken Kebabs (included here) and lemon rice. Cut chicken, red pepper (or whatever type of pepper you enjoy or have on hand) and onion into bite sized pieces. 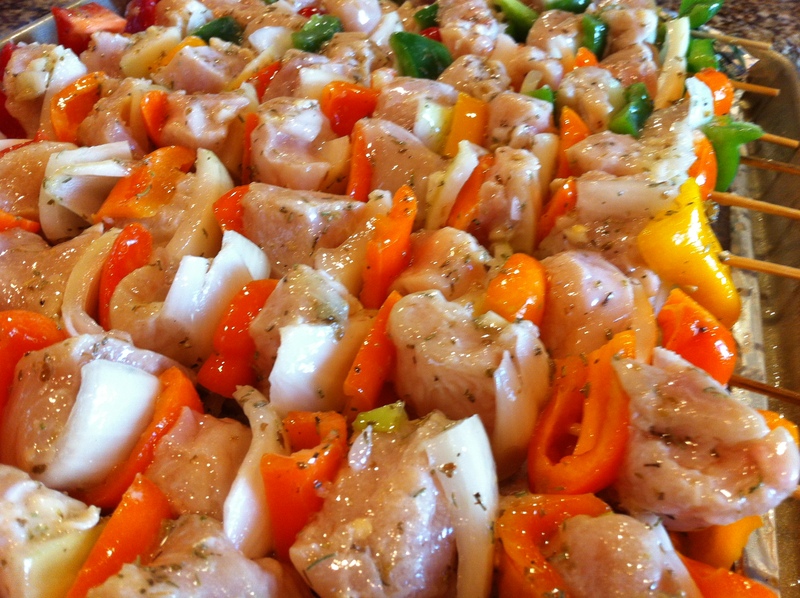 Place 1 piece of red pepper, then a piece of onion, then 3 pieces of chicken on a skewer. Or you can do every other like I did in this photo (above) – not necessary…I just wanted a pretty photo! Repeat this order until skewer is filled, ending with the onion and pepper. Mix remaining ingredients with whisk and either pour over kebabs or brush on both sides. Marinate for 1-2 hours. Before grilling, salt and pepper to taste. Grill until chicken is cooked through and vegetables are tender. Zest and juice the two lemons. Set aside. Bring water to a rolling boil. Add rice, chicken base, saffron, garlic and lemon juice. Stir and turn down to low heat. Cook for 15 minutes or until all water is gone. Mix in fresh chopped parsley and lemon zest. Fluff with a fork and serve. Barefoot Contessa makes a mean Tzatziki, using cheese cloth to strain the cucumber, sour cream and other good stuff like olive oil, kosher salt and wine vinegar…that is if you want to do it right. But, this is what happens to me…dinner is almost cooked, the family is gathering and I decide the meal won’t be complete without Tzatziki. So I start throwing it together, realizing I’m the only one who will eat it, so who cares anyway? Put yogurt in a bowl, peel and chop or grate the cucumber and garlic. Add to the yogurt; squeeze in a lemon (well minus the seeds). Chop some fresh parsley from your garden (1-2 T) or add some from the container in your cupboard. I don’t know how much…just a splash or dash. Add salt pepper and garlic granules to taste. Throw in some dill if you want to and enjoy! This is so easy. All you do is cut up any vegetables that you like. 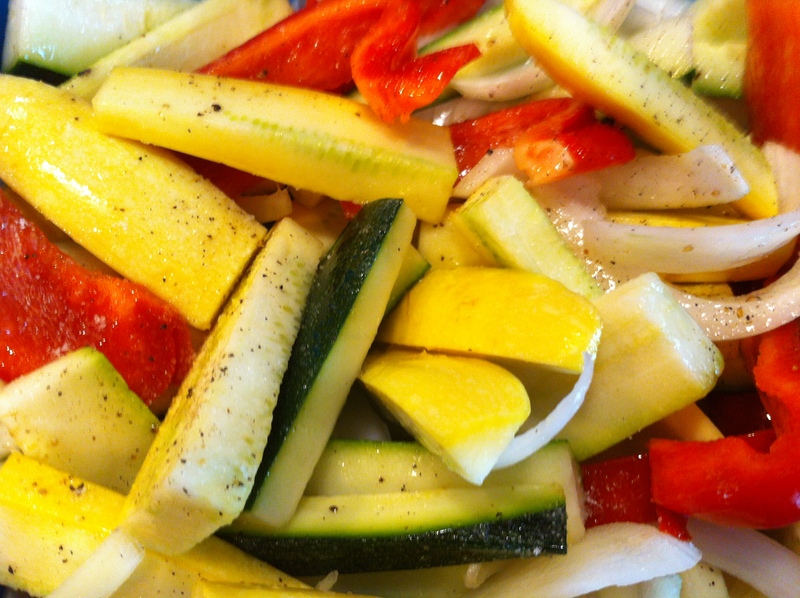 I used zucchini, yellow squash, red pepper and onion. Then I tossed it with a little light olive oil and salt/pepper. 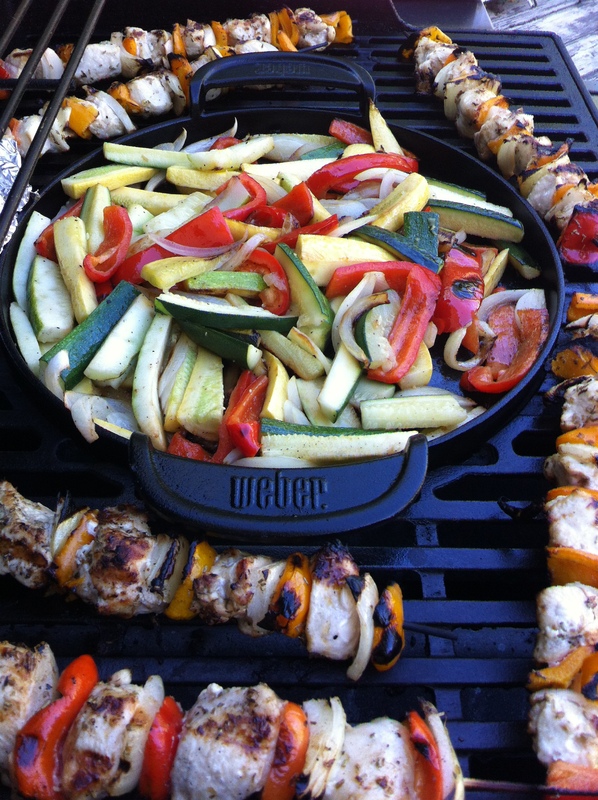 Bill threw it on the grill with the chicken kebabs, using our cool grill pan. If you don’t have one of those, just sauté on the stove top.